Using a plastic storage container as a cage is popular with many breeders. Clear plastic tubs can be purchased relatively cheaply. Storage containers can be easily cleaned and disinfected. Almost all bins need to have a modified lid in order to prevent escape. Hedgehogs can easily escape up and over bins using water bottles or accessories to give them a boost. Ideally, the top is modified to have a screen or grid, and the sides are drilled or cut to have most of the center removed. The lid cannot be used unless it is modified. A lid with holes drilled into it may not provide adequate ventilation. Time and care must taken to prevent respiratory infections. A drill may crack the fairly fragile plastic so be careful when drilling the side holes. Soldering irons melt the plastic but don’t look as neat and tidy. The plastic can be heated with a hair dryer and then cut with a utility knife. One problem with plastic tubs is finding one large enough and tall enough to accommodate the wheel and other accessories without customizing your cage. You can cut out a section of the lid to allow the wheel to move freely and then glue an appropriately sized smaller bin over the top to provide a “dome” over the wheel that prevents escapes. Some hedgehog owners connect several tubs together to create a habitat large enough for their pet. This option works well if you have creativity and plenty of space. You can purchase “clear” cages but even the clear style does inhibit easy viewing of your new pet. Many of our customers enjoy watching their hedgehogs, which is difficult to do with this style of housing unless you are standing directly over the cage. 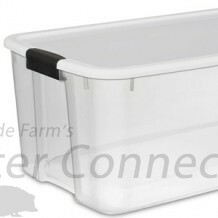 Solid color storage tubs are often larger and sturdier than the plastic tubs, but we advise against them because they have practically no visibility for your hedgehog. One must also take into consideration the hedgehog’s need for environmental stimulation when choosing housing for your pet. The plastic nature of the bins makes them difficult to safely add heat. You must be careful when using additional heat sources with these cages. Under-tank heaters can melt the bottom plastic. Heat emitters or heat lamps may cause problems with the top of the cage. The tall sides may block heat from a nearby space heater. Lids can be left off if you know the hedgehog cannot escape but solid hiding places or hanging water bottles can be used to give your hedgehog a boost up and over the top. To prevent the chance of escape, it is a good idea to use the lid and modify it to allow adequate ventilation and keep your pet secure.